As I mentioned in a previous post, the core value of “community” is one of the things that makes a Crossfit workout unique. As a pastor who is working at fostering organic and authentic communities of faith, it’s that value that I’d like to explore in this post. Working out together is nothing new. After all, XSport and the other big boxes offer group classes as part of the package. What distinguishes Crossfit, however, is the fact that camaraderie is part of the essential DNA. Even when a person does a workout alone, there is usually participation in virtual community via the Internet, a sort of invisible, universal Crossfit church. (We’ll look at this next week). For Crossfitters, an essential part of pursuing elite fitness is sharing that journey with others. When I showed up for my first few classes, the other members noticed me, took the time to introduce themselves, and seemed excited that I was going to be a part of their fellowship. I thought to myself, “So this is how a new visitor feels when they come to church for the first time.” Or at least, I hope this is how they feel. During workouts, everyone cheers for each other. When you are finished, high fives or fist bumps all around, even if you are lying on the floor. It’s just the way workouts are done. Most of the people in my gym see each other 4-7 times per week. They participate in races and competitions together. They are even talking about joining a softball league this summer. Indeed, the community is what it’s all about. 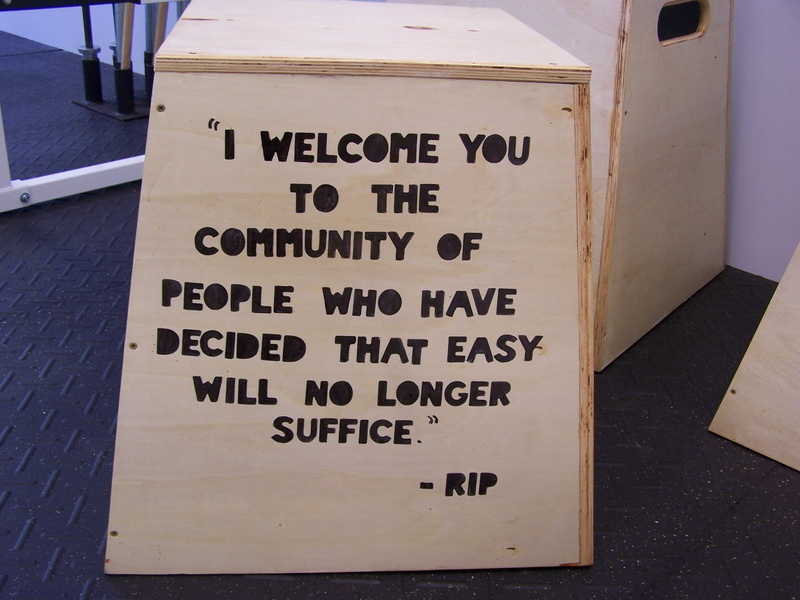 There is even a sign hanging the gym that says, “Invite Your Friends to Experience Our Community.” Not, “invite your friends to come and get buff,” or even “invite your friends to learn how to work out the right way.” Invite them to experience our community. In other words, belonging comes before body-building. There will be standards and expectations later. But for now, come and see what’s it’s like to be a part of our tribe. There is something compelling about a community where you are welcomed just for showing up, where every lame lurch forward is celebrated, where there is space to belong even as you learn a new rhythm of life. I don’t want to say that a church is supposed to be like a Crossfit gym. But we could do worse. We could be like XSport. Question: What is the closest community you have been a part of? This entry was posted in Church of CrossFit, Fitness and tagged Church, Crossfit, Culture by Justin. Bookmark the permalink.